I don't know about you, but when I think "plantation," I don't think Arkansas. The Walmart State may just be something I don't think about all that often in general. 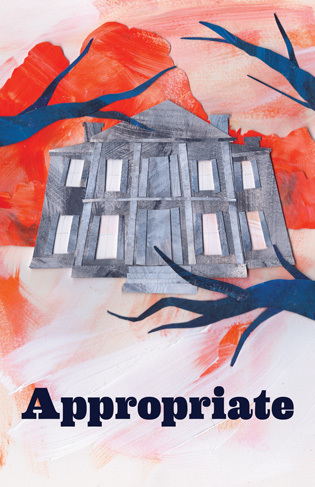 But Branden Jacob-Jenkins' Appropriate, one of the new plays produced as part of the 2013 Humana Festival, makes its Arkansas plantation -- or the remains and consequences of it -- unforgettable. After seeing this play, it's impossible not to think of Arkansas as a plantation state. By the way, I'm thinking the title is Appropriate, as in the verb appropri-8, meaning to steal, purloin, take and make your own, not the adjective appropri-it, meaning suitable or acceptable. That's important as the story goes on, as Jacob-Jenkins' haunting family drama dredges up painful memories of the plantation's terrible past, when people were property, something a slaveowner like the one who bought this plantation could appropriate. In the present, the Appropriate story unfolds around siblings Toni, Bo and Frank Lafayette. They were mostly raised elsewhere, but now they've returned to try to sell the place after their father's death. Was Dad crazy? Alcoholic? A hoarder? Or maybe a racist who kept horrifying memorabilia related to his home's unspeakable past? As the siblings argue over who owns what and who is responsible for what, they reveal details of their unhappy lives, accompanied by a rising cacophony of cicadas from outside. It's a ghostly, disturbing sound, and you can't help but think it has something to do with all the slaves whose bodies and bones were tossed into the woods behind the house when their "service" to the plantation had ended. Are there unquiet spirits out there haunting this place? Will anybody ever find peace here? The legacy of slavery, of cruelty and inhumanity and toxic power, hangs heavily over Appropriate. Whether they were raised in the place or not, the Lafayettes are poisoned by its past, and there is no more escape for them than there was for those slaves buried out back. In the Humana Festival program, Jacobs-Jenkins says that he is "interested in the relationship between collective memory and collective forgetting." As dramaturg Amy Wegener puts it, "[A]bsolution from past wrongdoings doesn't come easily, and moving forward without taking a clear-eyed look backward comes with a price." Even if that look backward brings up memories your family would very much like to forget. Jacob-Jenkins has created a provocative, disturbing play, one that deals with buried secrets of the family and national variety. For Actors Theatre of Louisville's Humana Festival, director Gary Griffin brought out all the mystery and conflict beneath the surface of the play, with excellent performances from Jordan Baker, Larry Bull and Reese Madigan as the Lafayette sister and brothers, Natalie Kuhn and Amy Lynn Stewart as the in-laws, and Gabe Weible, David Rosenblatt and Lilli Stein as the mixed-up kids. Antje Ellerman's decaying mansion house was grand and a mess, all at the same time, while Matt Frey's lights and Bray Poor's sound design contributed very nicely to the Gothic atmosphere. 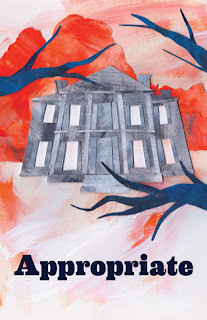 Appropriate will open the 2013-14 season for Victory Gardens Theater in Chicago, again directed by Gary Griffin, and I'm not surprised at the rapid pick-up. There are a lot of issues to dig into in this murky, messy mansion.